Danelson Mahautiere. His name alone tells you that this guy is "different". There are not many 17 year-olds in Dominica who are as focused on achieving their goals as Mahautiere appears to be. And the goal isn't easily achieved either; he plans to take on the best in the world at the premier sporting event on the planet. And he says he will win. "My dream is to get a gold medal at the Olympic Games," the young athlete told the Sun in an exclusive interview last Friday afternoon. "It is not a dream that I cannot achieve. It will take a lot of hard work and that is what I'm prepared to do." But he's also realistic; he knows deep inside that dreams don't always come true. "It's not guaranteed-I have to work hard, and I will work hard," he says. "Sometimes even if you work hard it takes time for results to start coming in. I will have to be patient; I will have to pray to God to keep me injury free." Prayers to God, by the way, are not alien to the Mahautiere. He's been there, done that and more. "I was a church-boy, an alter server-all that is still with me," he says. 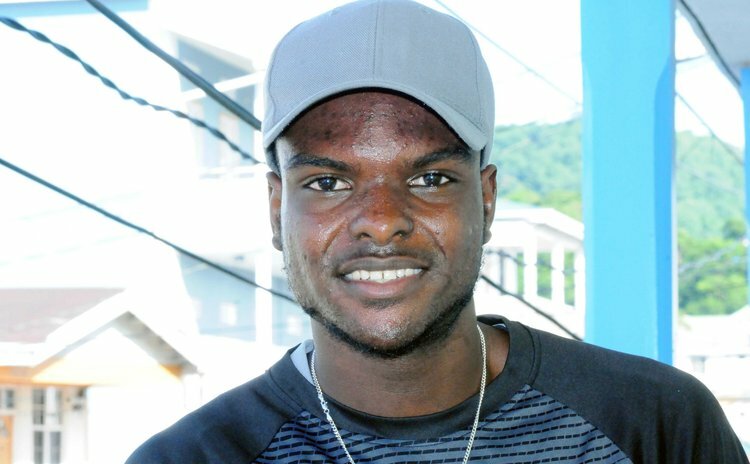 Mahautiere, in case you're wondering, is the 100 and 200 metre sprinter who gladdened the hearts of Dominican when he secured a silver medal at the recently concluded Commonwealth Games in the Bahamas. He ran 21.61seconds in the 200 metre event, a record and personal best for the rising athlete. Danelson also competed in the finals of the 100 metre, missing out on 3rd place by a fraction of a second, whilst also achieving another U-18 national record and personal best with a time of 10.61seconds. "At first I was disappointed, coming so close and not getting on the podium," he said. "Afterwards I realised that it all happened for the best. It was God's plan because that motivated me to go on." But where does Mahautiere get that laser-like focus and discipline? From his parents, his church and from his school especially the Cadet Corps, he reveals. "I was in the Cadet Corps and technically still is; I was Corporal and this instilled a lot of discipline," he says. "My parents; up till my mom died, my dad was a very disciplined man; he made me go to church every day." Mahautiere incorporates that discipline into his training regimen; he trains every day and sometimes twice a day, when the pressure is on. "Dominica is a mountainous country, so run up hills at least three times a week," he advises fellow athletes. "You need to go to the gym because in sprinting you need to be strong and your legs strong, you also need upper-body strength." And don't ever believe that Mahautiere does not have to fight himself, the demon inside all of us that says continuously "take it easy, man"; as Kobe Bryant, the former NBA star, said recently his most ferocious opponent has always been himself, not the big and tall defensive players who want to swipe his head off when he goes in for a layup under the basket. Kobe says he constantly has to motivate himself to keep training. Mahautiere says that too. "There were many times I felt like giving up, many times I felt like going back and sleep," Mahautiere said. "But I felt to myself that all those who were successful they have a story, they worked hard". He added: "I always tell myself when I'm not training that someone else is out there (training) and getting better than me." Mahautiere concludes: "I want to keep going further and keep challenging myself, keep seeing how far I can reach. If I give up, I will never know what I could have achieved." Mahautiere, with the help of the Government of Dominica and friends like Cheryl Rolle, is preparing to undergo training for nine months in Jamaica, the land that brought forth sprint giants like Usain Bolt, Asafa Powell and Shelly-Ann Fraser-Pryce. Maybe, one day in the not-very-distant-future Dominica will have a sprint giant too in the person of Danelson Mahautiere. Maybe it is appropriate to quote cricket commentator Ian Bishop (when he witnessed another man with a strange name, Carlos Braithwaite, win the T20 World Cup for the Windies with four consecutive sixes): we should "Remember the Name"- Danelson Mahautiere.